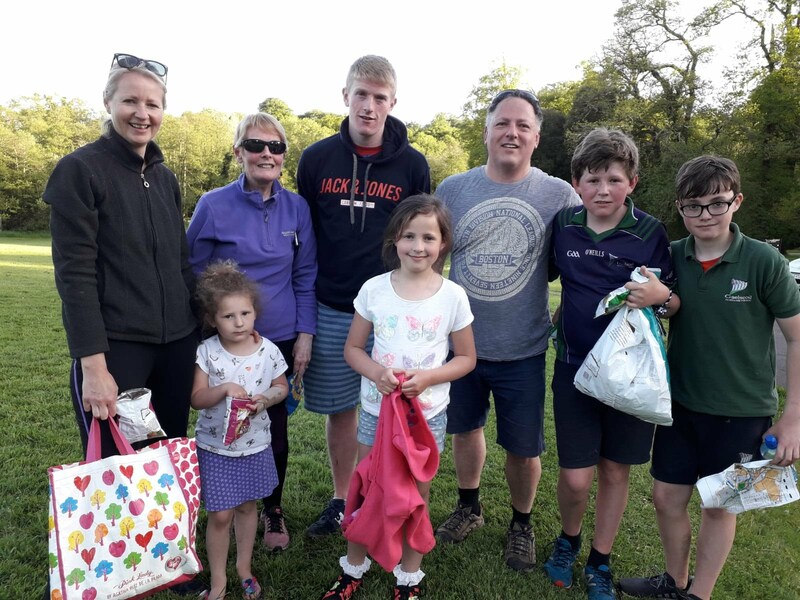 Event Winner Andrew Turner (third from left) with Curran and Larsson family following their post race picnic in Doneraile Park. The third event in the 2018 Summer League took orienteers on an adventure to North Cork and to the majestic surrounds of Doneraile Park. 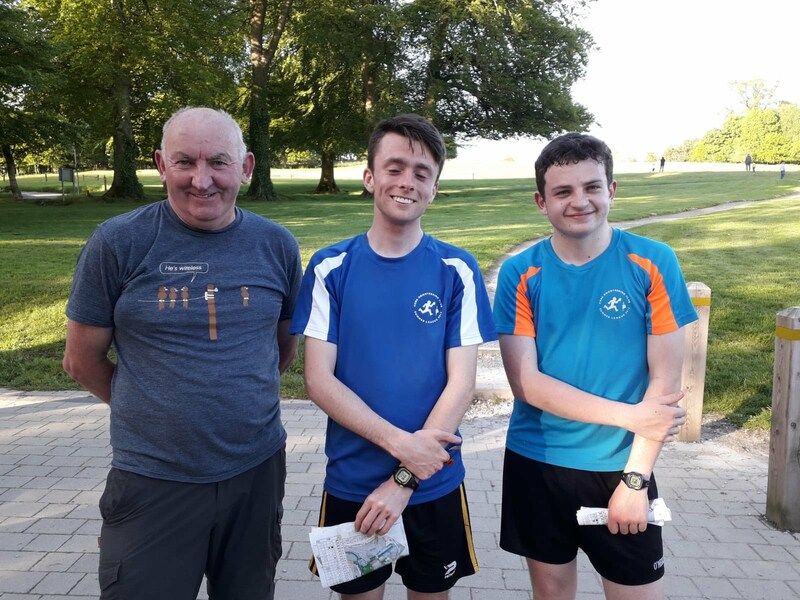 There were close to ninety orienteers in action on the night and all in attendance got a very warm welcome both from our North Cork crew and the fabulous sunshine. The glorious evening accentuated the splendour of this picturesque location. It was great to see the Fermoy Cubs back for yet another orienteering challenge. With eight teams of cubs in action on the night they had plenty of internal rivalry on the Short course. All who made the journey to Doneraile were rewarded with some intricate orienteering in charming environs. This year the planners took competitors to areas of the park which they hadn’t gotten to experience at previous events at this location. The Long course commenced with a series of Short fast legs in the northern section of the map before taking competitors on a loop around the meadow. Control nine proved troublesome for some due to it’s discrete positioning in the pit in the rough terrain. Controls ten to fourteen took competitors across a big meadow. The legs from 10 to 12 allowed for some fast running down the meadow. However, participants had to be careful not to get too carried away on these legs with the controls positioned in a shallow depression and a deep pit they weren’t easy to spot in the long grass and could readily have been overshot. The cautious orienteer navigated off the distinctive trees in the meadow to ensure they didn’t veer off track. Orienteers may not have been as light footed as the deer that pranced around the meadow below so the later starters may have benefited from the trail of trampled grass which led to these control sites. On exiting the meadow participants crossed the river before turning back toward Doneraile house. Control 18 was another that proved costly for some on the night. Those that tried to approach it too early got caught in the impenetrable vegetation. The terrain in the vicinity of this control was carpeted with wild garlic which no doubt left competitors runners reeking of this aroma on the journey home. The course concluded with another burst of short fast legs from controls 19 to 23. Unfortunately, some folks got distracted by the sight of the finish control and were drawn to it only to realise that one more control needed to be punched first. There was some ferocious competition on the 5.2km Long course this week and at the finish control a mere 29 seconds was the time difference between the top three competitors. Andrew Turner emerged as the event winner when he completed the course in a time of 30:10. Just 24 seconds behind him was Conrad Daly who took the runner up spot on the night. Conrad has a meagre 5 seconds lead over third place finisher Dan McDonnell. The fastest lady around the Long course in Doneraile Park was Sinead O’Donoghue she punched all 23 controls in a time of 44:52. Runner up on the night was Sharon Lucey who covered the course in a time of 45:54. The final podium spot went to Elaine Sheridan who completed the course in 46 minutes and nineteen seconds. There was also some fierce competition on the 2.4km Short course. The Short course event winner honour went to Clare Nuttall who proved fastest on the night. Clare finished in a time of 26:17 just 23 seconds clear of Liam Twomey. Liam was runner up on the night having punched all 14 controls in a time of 26:40. There was quite a battle for the final podium spot with only 13 seconds differentiating the next two competitors at the finish line. However, Jack O’Shea held off a strong challenge from Nedas Norutis to take third place. Jack finished the course in a time of 27:31. Huge thanks this week to all of our North Cork crew for staging the event in such as stunning location. Thanks to Jim Callanan for planning the courses, Denis Power for taking care of entries on the night and Siomha and Ailbhe Callanan for registration and download. Thanks also to Ted Lucey, Brendan Wall and the Midleton CBS students for taking care of control collection. Once again, this event wouldn’t have been possible without the support of the Cork Schools Orienteering Association (CSOA) who gave us the use of their map and the Office of Public Works (OPW) who granted us access to this wonderful amenity. Today marks the start of World Orienteering Week and our next Summer League event will give our followers an opportunity to participate in this worldwide affair. Hope you can join us for World Orienteering Day! Anne Marie Lucey and Susan O'Donovan at download. Podium finishers Elaine Sheridan and Sharon Lucey. O'Cinneide Family and Fermoy Cubs enjoying refreshments after their run. Nick and Martha with the youngest member of the our North Cork crew Aoibhin. Control collectors Ted Lucey, Dan McDonnell (also third place finisher) and Cathal Lane. Thanks to Jim Callanan for all the great photos.